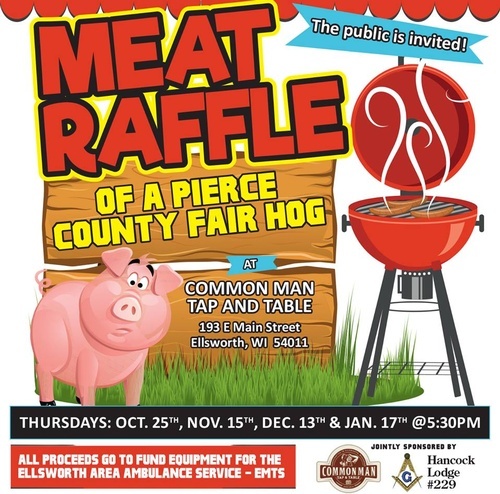 Common Man Tap & Table is partnering with Hancock Lodge #229 of Ellsworth to host their meat raffle. Proceeds will go to help the Ellsworth Area Ambulance Service raise funds to purchase new equipment. Join us on Thursday, January 17, 2019. The meat raffle will begin at 5:30 pm. C'mon out and join in the fun...try your chance at winning various cuts of pork & beef. Plus, enjoy any sandwich on Common Man's menu for half price plus $3 Honey Blonde Ales and $1 Shorty beers while supplies last. Meat Raffle for various cuts of pork and beef.